If you were to pinpoint what makes Lewis County great, one strong factor would be the close-knit connections you find between families, friends and businesses. It’s the trust you feel knowing that wherever you go, you can find a friendly face such as a teacher, coach or neighbor, and have someone to strike up a conversation with. It’s being able to build an extended family that will help raise your children, and provide plenty of stories for the next generation. At Lewis County Coffee Company in Chehalis, they not only embody the Lewis County spirit – they serve it up in a cup, top it with whipped cream, and throw on some chocolate shavings and caramel drizzle to give it that extra dose of love and community feeling. Open since December 2016, the small coffee stand off I-5 in Chehalis has already been an active force in the community. 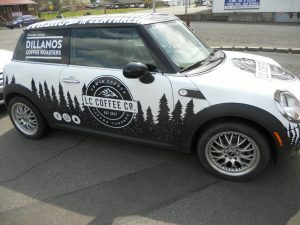 Equipped with their own custom-decaled delivery vehicle, Lewis County Coffee Company can brings drinks straight to your home or business, free of delivery charge, as long as you have a four-drink minimum. Having delivered all the way up to Napavine and down to the Centralia Industrial Park, the service has taken off with many schools and businesses. “The service was great, the baristas were great and the coffee was great,” affirmed Fords Prairie Elementary School secretary Donna Martin. The business is also a family endeavor, too. 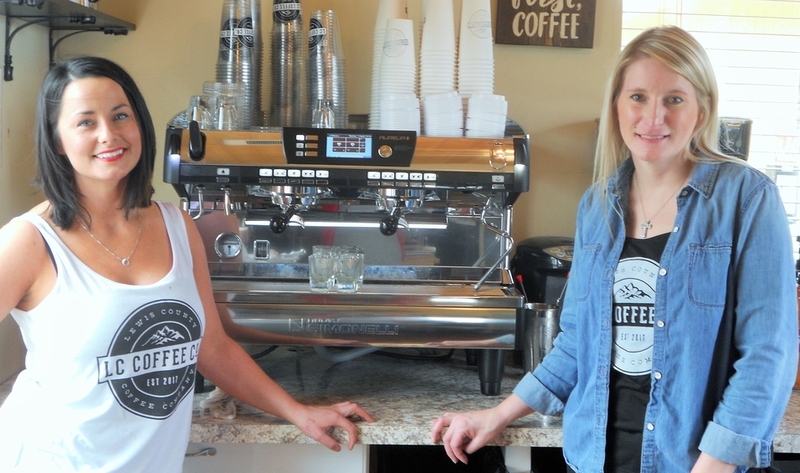 When owner Samantha Styger’s daughter expressed an interest in the coffee business, they purchased the stand on State Avenue and purchased new equipment and built a place where their family could serve other families. Working with a local designer, the espresso stand was completely rebranded to represent the Pacific Northwest. 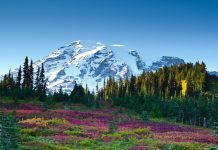 When customers drive up to the window, they will see reminders of their great state all around them – evergreen trees, mountains, campfires, flannels and even Sasquatch. Even the drinks on the menu have a taste of the Pacific Northwest in them, from the minty Evergreen to the chocolatey Cast Iron Cookie Mocha. “We’re working always to be innovative and offer new and different things you can’t find anywhere else,” said Styger. With a team of five baristas, the Lewis County Coffee Company is dedicated to keeping their quality consistent and their service top-notch. Unique to the stand are all-natural Lotus Energy drinks, with each flavor named after a different local high school sports team, including the Pirate, Tiger, Lumberjack and Bearcat. If you’re unsure of what energizer to order, you can also leave it up to your barista, who will make a “Swamp Cup” containing their custom creation. They can also make drinks to accommodate dietary needs, including sugar-free syrup and dairy free, almond, soy and hemp milk. 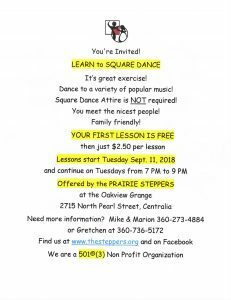 When asked what she loves about having a business in Lewis County, Styger praised the variety of events available in different parts of the county. From the Blueberry Festival in Morton, to the Southwest Washington Fair, to Winlock Egg Days, the variety of events gives her plenty of opportunities to grow her business and do community outreach. “Each town has their own thing, and we dig that. Once summer gets here, there’s always something to do,” Styger said. By cleverly naming the business Lewis County Coffee Company, Styger has made it so that the coffee stand can expand regionally, instead of being branded to a fixed location. Loyal customers proudly wear their trendy black-and-white Lewis County Coffee Co tank tops, helping take some of the burden off Styger for advertising. But with a great location by a gas station off I-5, it’s hard not to attract a following of new and old customers. Business opportunities aside, Styger simply loves Lewis County because she’s grown up here and loves the close connections she’s made. “We know their names and we know their dog’s names – we even serve the dogs ‘puppacinos,’” said Styger. Her own kin aside, Styger has some outside connection to each of her baristas, making their bond even stronger. And when company morale is high, so is customer service. Despite the endless cold and wet weather in the Pacific Northwest, you can rest assured that you’ll find hot, delicious coffee and warm smiles as you pull up to the window at Lewis County Coffee Company. Lewis County Coffee Company is located at 1349 NW State Avenue in Chehalis. You can give them a call at 360-748-6809 or visit their website to learn more about them.